I would focus on the perimeter of the sump's walls first. Then after it has set for about 45 minutes or so, you can glue the baffles to the base. What I do just before I glue the baffles, I take a pin to verify the gap. If it is pretty snug, it's ready to glue. If the pin moves about too easily, I'll take some newspaper sections and place them under that area of the sump, whch pushes the base upwards against the baffles. Now it is ready to glue. what size guitar string will work for pins? I bought "G" and "E" strings and I believe that they are too large. But I am also just practicing with 3/8" and 1/2" scrap material I got for free from work. I have no idea the brand or if they are cast or extruded. After reading all 25 pages I beleive that they are extruded because even with the 1/2" I dont have to wait but a few seconds to pull my pins. I guess I got pretty lucky because I got 3 sheets of 1/2" that measure about 2 ' by 6' and one sheet of 3/8" that measures about 2' by 8' for free from work. They are pretty scratched up but for practice it dont hurt. I know I've seen it in one of these threads before, but haven't had any luck finding the post yet. What size acupuncture needle is everyone using for 3/4" cell cast and Weld-On #4? I do some almost everyday, just do it before anyone else arrives in the morning. In my shop, the smell dissipates in an hour or two. I got a question for weld on 40 do you guys leave a gap?how you guys do the gap with the router or ah sow or just simple applied the weld on 40 and put the pic how big or how deep the gap. Has to be??? Haven't seen action here in a long time but have been reading through and learning alot. Below is a pic of what i am planning on building for my sump. 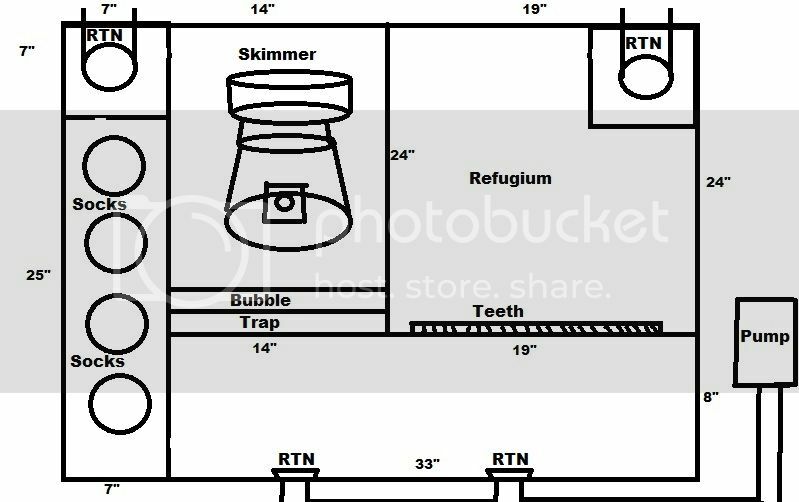 Overall dimensions are 40x32 and i am wondering if i were to bring middle support that devides the skimmer and fuge all the way across to the front, if that would give enough support to go with 1/4". Assuming that i will have to go with 3/8" but would love to the the extra $100 per sheet off and go with 1/4" if it is safe. I am also not against putting a good sized perimeter on top if needed. Also the height will be either 18" or 24"
I also am planning on going with white acrylic for all but the front pannel. should i expect any complications when welding the white to the clear? Got some advise from a very smart man and also calculated the volume of the sump and will certainly be going with 3/8". Also will be going 18" tall. Any improvements are still welcomed.